We all have an intuitive appreciation that river water contains a variety of dissolved and suspended constituents. Mountain streams appear pure, farm creeks often are muddy with sediments, and drainages in limestone-rich regions are fertile while those containing only granitic rocks usually are less so. 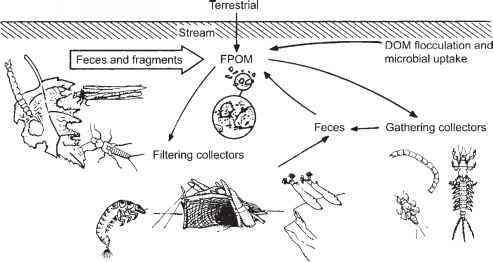 The rivers of heavily populated areas, and even the rain, are polluted by human activities. Many factors influence the composition of river water, causing variation from place to place. Rain is one source of chemical inputs to rivers, and a stream flowing through a region of relatively insoluble rocks can be chemically very similar to rain water in its composition. Most streams and rivers contain much more suspended and dissolved material than is found in the rain, however. Ultimately, all of the constituents of river water originate from dissolution of the earth's rocks. The dissolving of rocks commonly is the major determinant of river water chemistry locally as well, but this varies with geology and with the magnitude of inputs via other pathways including precipitation, volcanic activity, and pollution. Materials are concentrated by evaporation and altered by chemical and biological interactions within the stream. Unlike seawater, which is quite constant everywhere and can be approximated with an artificial standard, river water varies considerably in its chemical composition (Livingstone 1963). In this chapter we shall concentrate on the major dissolved constituents and the gases. Suspended sediments and their transport were described in Chapter 3. Organic matter and dissolved nutrients are strongly intertwined with biological processes, and are discussed in Chapters 11 and 12 delving into ecosystem dynamics. Readers wishing more detailed discussions of aquatic chemistry and geochemistry should consult Berner and Berner (1987), Stumm and Morgan (1996), or other specialized volumes. Oxygen, carbon dioxide (CO2), and nitrogen (N) occur as dissolved gases in river water in significant amounts. Although N gas can be incorporated into N cycling within stream ecosystems by certain specialized bacteria, the concentration of dissolved N2 itself is of little biological importance. Both oxygen and CO2 occur in the atmosphere and dissolve into water according to partial pressure and temperature (Table 4.1). The solubility of oxygen in freshwater is reduced at high elevations due to lower atmospheric partial pressure. It also decreases with increasing salinity, by about 20% in normal seawater. Air is nearly 21% oxygen by volume and just 0.03% CO2, but the latter is much more soluble in water. Hence, although saturated freshwater has higher concentrations of oxygen than CO2, the difference is not nearly as great as is found in air. Groundwater frequently is very low in dissolved oxygen and enriched in CO2 due to microbial processing of organic matter as water passes through soil. Localities that receive substantial groundwater inputs may reflect this, but equilibration with the atmosphere usually occurs once hyporheic water enters the stream. TABLE 4.1 Concentration of dissolved oxygen and carbon dioxide in saturated pure water for atmospheric partial pressure at sea level.